Check and inspect floor leveling. Perform a test on elevator doors. Q: what is an “Elevator Platform”? An elevator is defined as a device consisting of a platform used to raise and lower occupants and /or equipment from one floor to another (Fgr. 1). The objective of elevator maintenance is to ensure that the elevator system provides safe and dependable operation with maximum efficiency and minimum downtime. Failure to keep an elevator properly maintained will result in a decrease in reliability and an increase in response time. In addition, the safety of the elevator's occupants will be compromised. Full maintenance contract can and should be purchased from the manufacturer of the equipment. Purchasing a maintenance contract will assure that the manufacturer takes full responsibility for that equipment. However, even with a maintenance contract in place, the elevator should be checked on a routine basis by the facilities maintenance technician to ensure that the elevator is operating properly. As mentioned earlier, although elevator maintenance and repair should only be performed by certified elevator mechanics, the facilities maintenance technician should still perform routine inspection of the elevator to ensure that the elevator continues to operate efficiently and safely. If any of the following situations should arise, then it's the responsibility of the facilities maintenance technician to report the problem to his or her supervisor and /or the elevator maintenance company. In addition to being an inconvenience to the occupants of a facility, long response time can also be an indicator that the elevator control system has or is developing a problem. On a regular basis, the time spent waiting for an elevator as well as its speed should be logged and com pared to the manufacturer's specification. This is done by checking the time required for the elevator to travel from the bottom floor to the top floor during peak and non peak times. When the elevator platform (the floor of the elevator) does not meet the floor of the building, it creates a tripping hazard. This can be as a result of the elevator platform either sticking above or below the structure's floor (Fgr. 2 and 3). 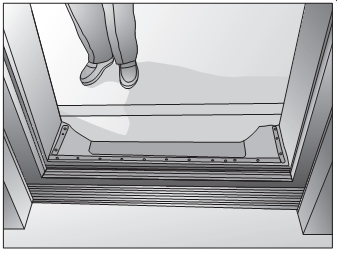 According to accessibility codes, elevators must automatically level within ½ inch. 3: The elevator that's not leveling properly -- the elevator is below the floor. Overheating is a common problem associated with electrical traction elevators because the equipment is usually located above the facility roof in a penthouse. Because the mechanical room is seldom climate controlled (heated and /or cooled instead they are ventilated-typically by louvers), they are allowed to have temperature swings depending on the out side air temperature. 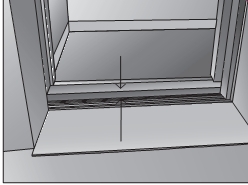 If the mechanical room's ventilation is located near the floor, then the outside air temperature can exceed 100°F. It should be noted that as the temperature in the mechanical room increases so does the possibility for breakdowns. 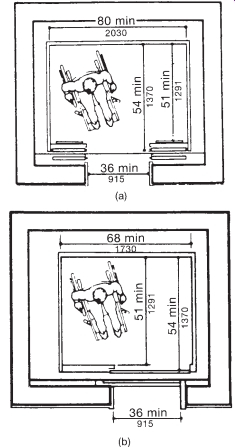 4: Minimum entrance requirements for an elevator. With a stopwatch, check the reaction time of the elevator doors. 1. Record a baseline time. This will be the time recorded the first time you measure the time the doors take to close. 2. On a regular basis, measure the time, record, and compare it against the baseline time. 3. Report the results to your supervisor. An elevator is usually the easiest way to provide access to upper floors when access is required above the ground floor. If an elevator is installed, it must meet the ADA requirements whether the elevator was required. Every floor that the elevator serves will have to meet ADA access requirements regardless. 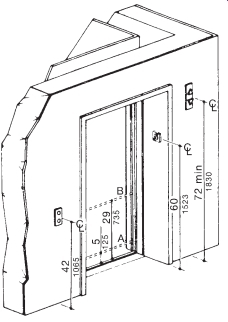 The elevator must be automatic and have proper call buttons, car control, illumination, door timing, and reopening as shown. The elevator floor is a part of the access route so it must be similar to the floor described in walks and hallways. The shape and size of the elevator must be such that it's usable by a wheelchair. True or false? If the platform of the elevator is not level with the floor when the door opens, the technician can make the required adjustments without consulting an elevator service technician. True or false? If the elevator door does not open completely for any reason, the facilities maintenance technician should report it as soon as possible to a qualified elevator technician or a supervisor. What should a facilities maintenance technician be looking for when inspecting an elevator? What does a long response time for an elevator typically indicate? Define the term elevator. True or false? Only elevators that are accessible by the public are required to meet ADA requirements. Upon completion of this job sheet, you should be able to identify any safety requirements not being met by the elevator.